We are sure you are familiar with the wonderful MB&F Horological Machines from Max Büsser & Friends that we’ve reported about so often in the past. Futuristic timepieces that could easily play a role in the blockbuster Transformers. It wouldn’t surprise us if you’d find your HM3 or HM4 transformed in a miniature robot some day. Perhaps that is also a reason not to buy a MB&F timepiece for some people. Too futuristic, wild or out-of-the-box. “Beautiful, but not on my wrist”. Founder Maximilian Büsser heard you. 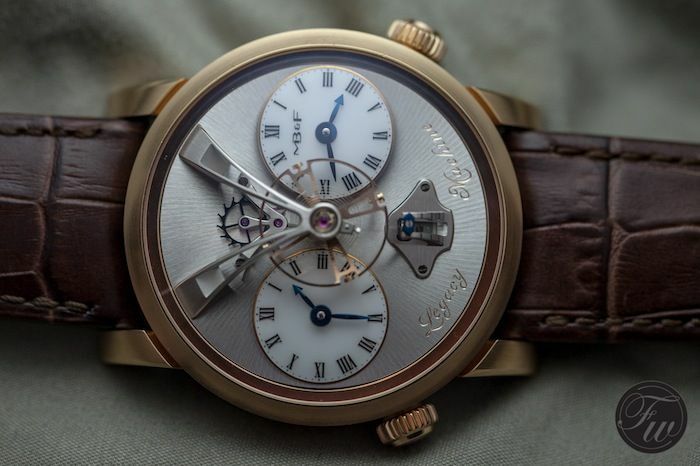 He created the MB&F Legacy No 1, a timepiece that could easily have its roots early 1900s. 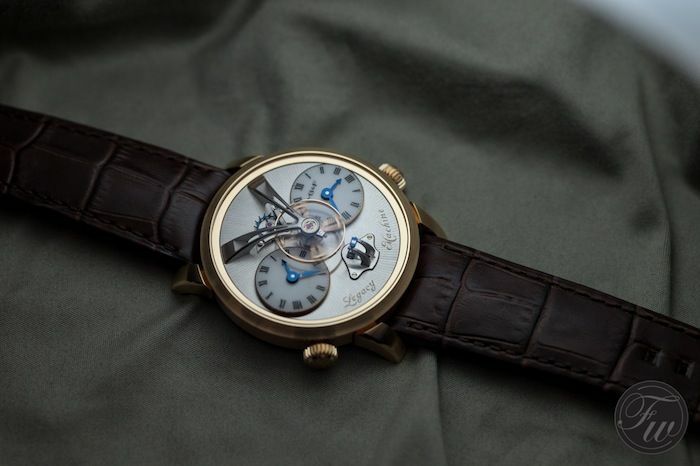 He wanted to create a classic round watch, but with the typical MB&F edge to it. 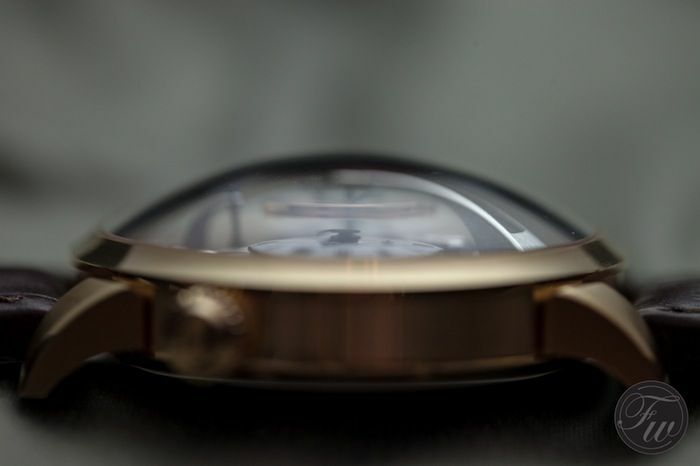 The result is a super cool round watch with a super domed sapphire crystal in order to have a three-dimensional dial. The bridge with the balance hanging over the 2 elevated sub dials. 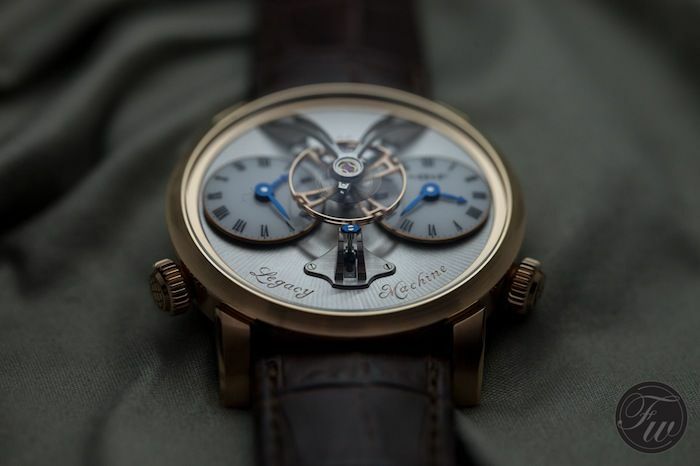 The escapement visible at 12 o’clock and a vertical power reserve indicator at 6 o’clock. 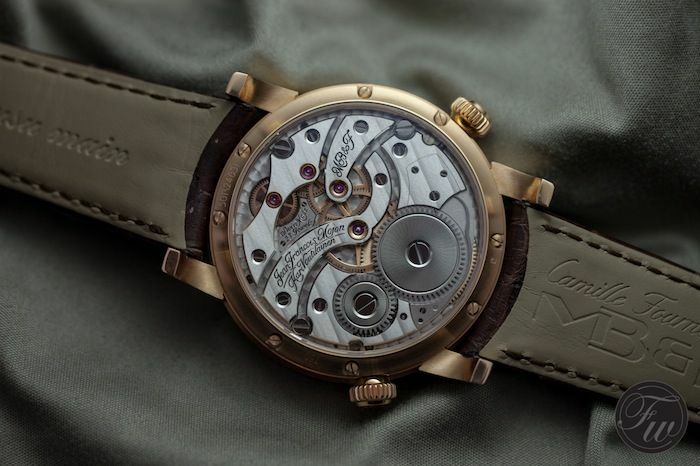 The movement for this watch has been created with the help of friends Jean-François Mojon and Kari Voutilainen. As you can see, the dials on the watches show both hours and minutes. It means it is a watch with an extra time-zone. A traveler’s watch! The left dial is the actual time zone and the right dial would be the home time indicator. 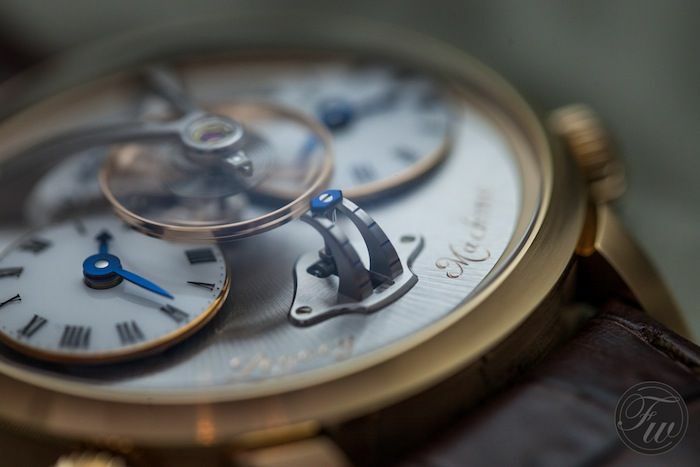 Each dial has its own crown for setting the time (located at 8 o’clock and 4 o’clock) and the crown on the right side (4 o’clock and setting home time) you can wind the watch. 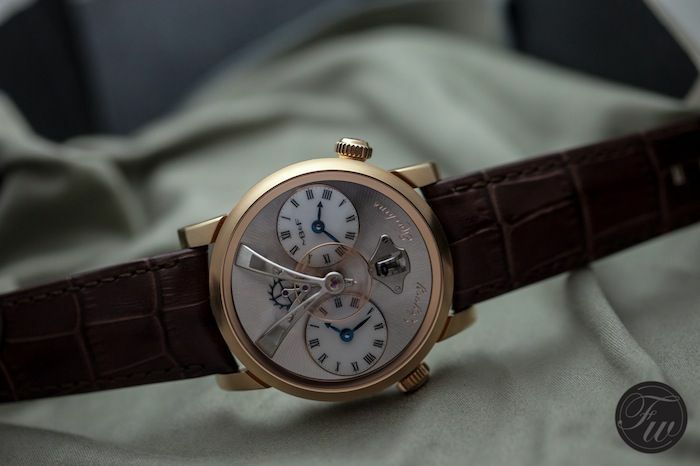 The power reserve indicator will move upwards as soon as you are winding the watch. 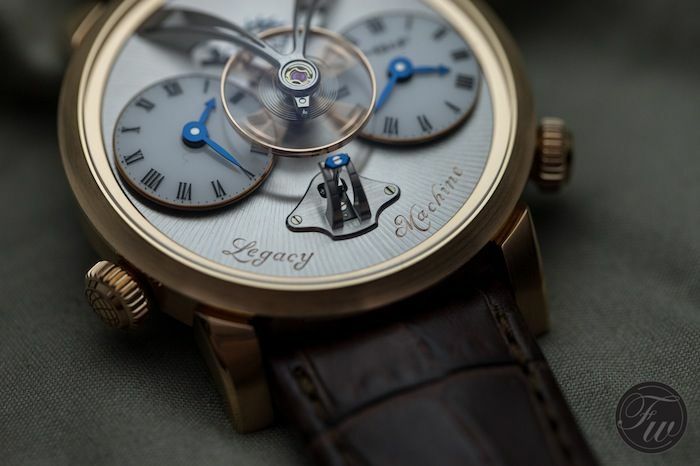 Flipping the Legacy No1, you will see the hand-wound movement with super fine finishing. All in a 19th century style and handcrafted. 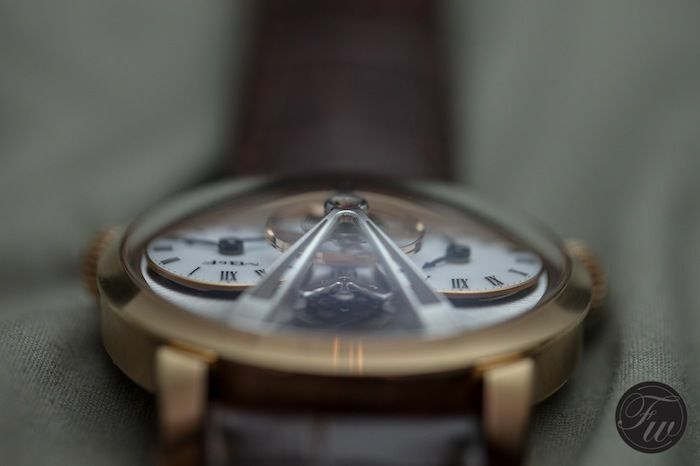 Polished bevels, Geneva waves and cool engravings. 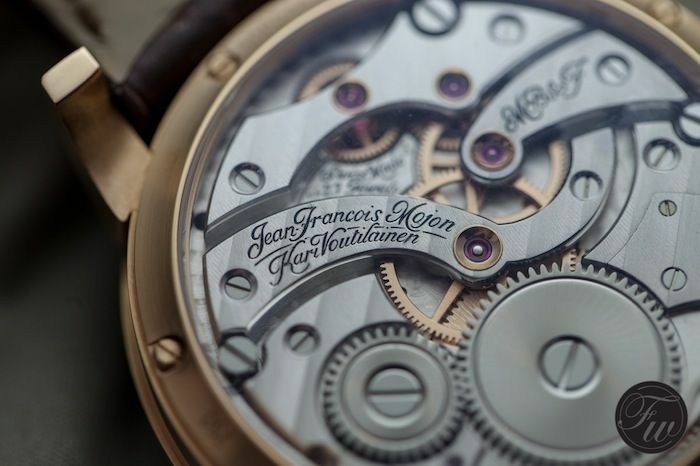 The movement consists of 279 parts and a power reserve of 45 hours. Enough already, this ought to be a photo essay! Enjoy! The MB&F Legacy No 1 is also available in 18 carat white gold. 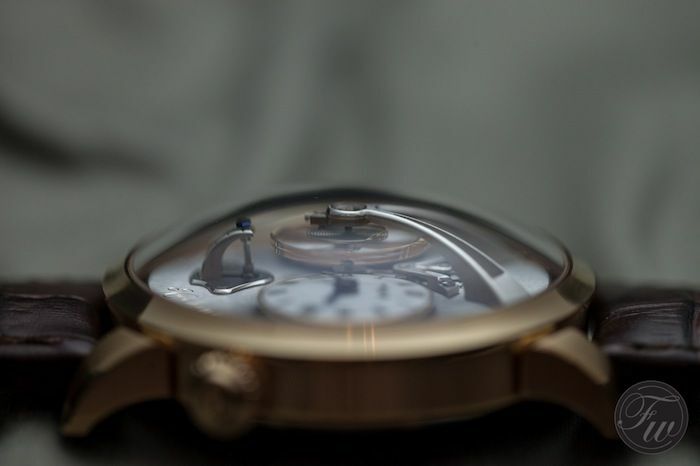 Visit the official MB&F Legacy No 1 website here.